Justice Department Announces Largest Corporate Bribery Penalty Ever : The Two-Way The Justice Department says two Brazilian companies have agreed to pay more than $3.5 billion for violating U.S. bribery laws in their dealings with Brazil's state-owned oil company, Petrobras. 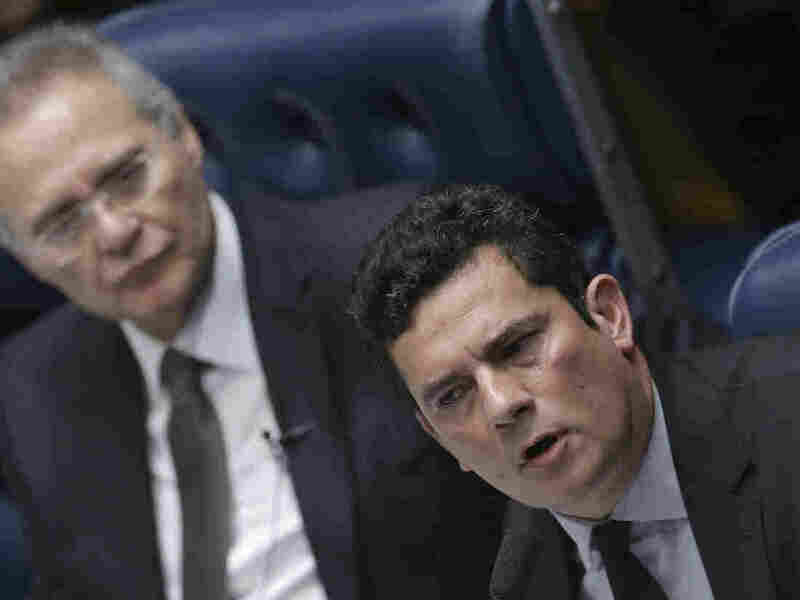 Brazilian Federal Judge Sergio Moro (right) is leading his country's corruption probe of state-run oil company Petrobras. Two Brazilian companies have agreed to more than $3.5 billion in fines for violating U.S. bribery laws in their dealings with Petrobras. Two Brazilian companies accused of a massive bribery scheme will pay more than $3.5 billion in fines to U.S. and Brazilian authorities. Under the agreement, the enormous construction conglomerate Odebrecht will pay $2.6 billion, and its petroleum subsidiary Braskem will pay approximately $957 million, for their dealings with the state-controlled Brazilian oil company, Petrobras. The U.S. Justice Department said it was the agency's largest corporate bribery resolution ever. "The anticorruption investigation, known as Operation Car Wash, has led to the arrests of dozens of executives of construction companies for their involvement in the graft scheme, in which builders overcharged Petrobras for projects and then channeled some of the money to politicians and their parties. Scores of politicians are also under investigation by the probe." Although Odebrecht and Braskem are both based in Brazil, they trade their stock on U.S. markets and conduct business through U.S. banks, making them subject to U.S. anti-bribery laws. Both companies pleaded guilty to violating the U.S. Foreign Corrupt Practices Act. "It's really hard to explain just how omnipresent Odebrecht is in Brazil, and Latin America generally. They are everywhere and they have had a hand in building almost everything — four of the World Cup stadiums alone. For the Olympics, the company is helping to build the Athletes' Village, an express bus line and the Olympic Park, plus a subway line. But that's really just the tip of the iceberg — they operate in dozens of countries around the world, too, including in the U.S."
Earlier this month, Odebrecht released an unvarnished statement of guilt titled "Odebrecht Apologizes For Its Mistakes," which began "Odebrecht acknowledges its participation in illicit actions in its business activities" and said the company had given in to "external pressure." The Securities and Exchange Commission alleges Braskem "made approximately $325 million in profits through bribes ... paid to a government official at Brazil's state-controlled petroleum company as well as Brazilian legislators and political party officials," according to a Justice Department announcement. The federal government alleges the bribes were paid through a separate company that was Braskem's largest shareholder. The Justice Department says it worked with officials in Switzerland, where some of the bank transactions were handled, according to Bloomberg, as well as Brazil to investigate the scheme. Two-thirds of Braskem's payment will go toward "criminal penalties and fines." The other third will be paid to the U.S. and Brazilian agencies that carried out the investigation. The SEC said that despite the enormous settlement, its investigation into the companies is ongoing. Brazil is also investigating corrupt dealings related to Petrobras. In 2015, Odebrecht's founder was arrested by Brazilian authorities in connection with the investigation, as we reported.